Petty Officer Alonzo Garcia, moonlighting as security for a successful marijuana dispensary, is critically injured during a $250,000 robbery, and his driver, Jason Reed, is missing. 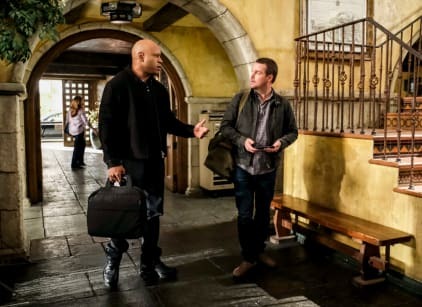 Deeks and Kensi go to the robbery scene, while Sam and Callen go to the hospital. Kensi thinks the robbers have military training because they chose to rob at a choke point. She also finds a casing. Alonzo blinked Reed's name to Sam then seizes. Hetty is back. Kelly James, the dispensary's owner, detailed transportation procedures for Sam and Callen. Kensi theorizes that Reed, the missing driver, might be involved in the heist. The casing had a print of petty criminal Brian Booker. Booker tries to escape on a scooter but Sam knocks him off with a surfboard. Hetty asks Nell about her mother, who is refusing triple-bypass surgery, and Nell goes off. Hetty has arranged for she and Nell to take a flight to San Francisco, so she can talk to Nell's mother. Kensi discovers a burner phone near Booker's home and Eric tracks its previous calls, finding a location where one was used repeatedly. Sam pounds on the door there and gunfire ensues, leading to a standoff. NCIS rushes the house, which looks like it belongs to a hoarder. They shoot and kill the homeowner, Edward Morrison, who wouldn't surrender. He shouted the white-nationalist mantra: "We will not be replaced." A group of white nationalists is stockpiling weapons. Reed and Morrison had worked together previously. Kensi selects a choice location for a sniper near a planned immigration-reform rally. Sam has Fatima call Reed to distract him. Then Deeks plays a crazy homeless man. Finally, Sam knocks out Reed. Hetty tells Eric she wants to talk with him when she returns about his new job offer.